Maize field at Kampi ya Moto, Kenya (photo on Flickr by C Schubert/CCAFS). 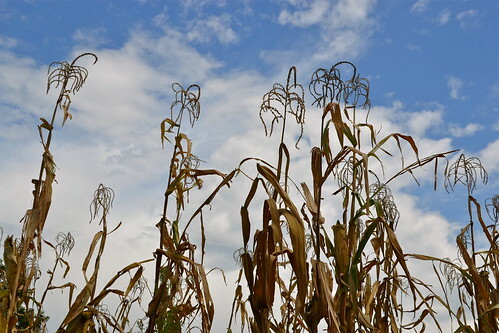 A September 2013 special issue of the scientific journal Field Crops Research describes research to improve, and make wider use of, dual-purpose maize (or corn) varieties, which are used for their stover — the stalk, leaves and other residue of the plant after the grain has been harvested — as well as for their grain. Among smallholder farmers in Africa and other developing regions, maize stover is a common, and critically important, supplementary feed for ruminant livestock. The special journal issue was edited by edited by Elaine Grings, of South Dakota State University (and formerly of ILRI); Olaf Erenstein, of the International Maize and Wheat Improvement Center; and Michael Blümmel, of the International Livestock Research Institute (ILRI). The following statements are excerpted from a synthesis paper written by the editors, which presents key ﬁndings in 12 papers about the potential for dual-purpose maize varieties to meet changing maize demands. This special issue substantiates that dual-purpose maize varieties are technically feasible and have a large potential market, particularly in many emerging markets. The reported ﬁndings argue the case for continued investments in maize stover R&D and thus reigniting earlier dual-purpose crop research in general. 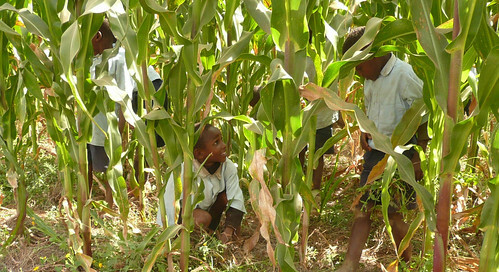 Children weed a maize plot at Kampi ya Moto, Kenya (photo on Flickr by C Schubert /CCAFS). Among the findings are the following. There are prospects within the range of stover quality to increase fodder quality without compromising grain yield. 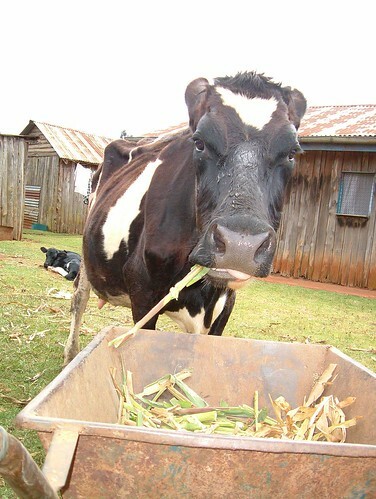 A dairy cow on one of Kenya’s many smallholder farms consumes maize stover, an important supplementary feed in East Africa (photo credit: ILRI). Read the synthesis paper, as well as other papers, in this special issue of Field Crops Research 153 (2013) 107–112, edited by Elaine Grings, Olaf Erenstein and Michael Blümmel. The papers authored by ILRI scientists include the following. Field Crops Research special issue on dual-purpose maize for food and feed, 15 Nov 2013.